A few months ago Cam became a willing participant in a pumpkin growing competition with some friends from work. For a couple of weeks he had a pumpkin seedling sitting on the window sill at work. He would mention to me now and then that he needed to bring his pumpkin home so I could look after it – he thought this was his best chance at winning the competition! Anyway as it turned out his pumpkin plant became too precious for him to take home on the subway so my first duty was to collect the pumpkin from his office in our car and drive home. Let me add here, that this was my first time driving in Manhattan – yes, to bring the pumpkin plant home! 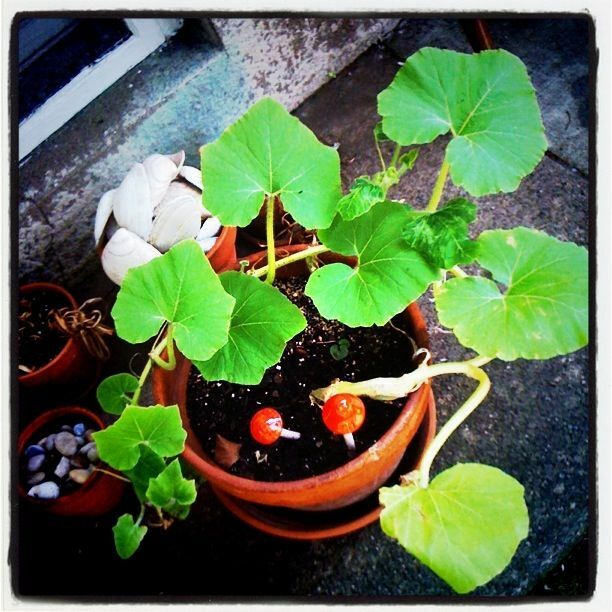 Once home, I re-potted the pumpkin into a large pot. I watered it daily and hoped for the best. About a month ago I started feeling like it was time for the plant to go into the ground. I could not of course plant it in the ground in Brooklyn and so waited patiently until we moved. 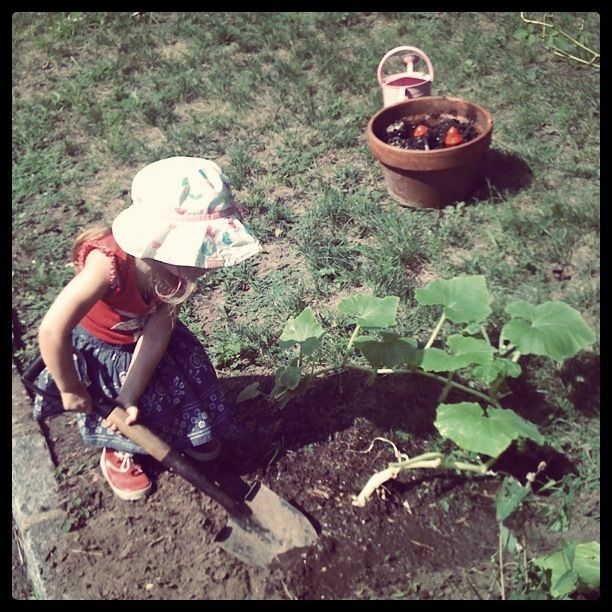 On our third day hear I borrowed a shovel from Nina, picked the sunniest spot in the yard, dug a hole and planted Cam’s precious pumpkin plant! Nina’s husband Gene explained to us that their zucchini does not grow as the moment it gets flowers the chipmunks eat them – who would have though chipmunks devour zucchini flowers! 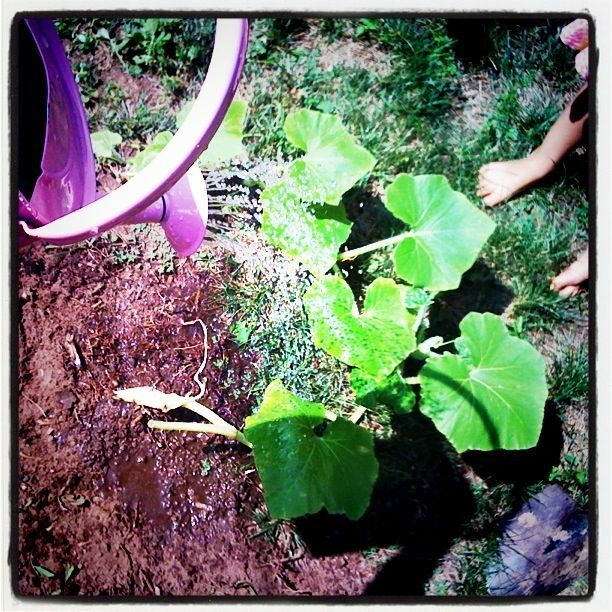 So fingers crossed we will actually grow any pumkins, let alone a giant one! Have you done the research Kirsten about what to feed it? How fun! I have not – what do you suggest? I gave it some plant food, but what else should I do? I was thinking that because you, Cam and the girls had so lovingly cared for his pumpkin plant, that it is probably not a good idea to experiment on his (maybe you and the girls can do some science work on some alternative plants!) …. but I can say that I have heard of adding sugar to your water to get them to grow big …. this might be a helpful link too for other ideas! You have motivated me to do some growing with the girls for the Lismore Show later in the year!